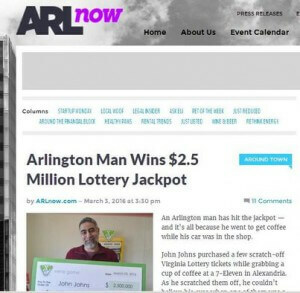 Patience may be a virtue but a man from Arlington is reaping the rewards of impatience. John Johns left his car at the shop to grab a cup of coffee and was enticed into buying a few instant tickets at a 7-11 store in Alexandria. By the time he left the store he was $2.5 million richer after bagging the top prize in the Cash Winfall game. The winner later opted to receive the prize as a single payment of $1.35 million before taxes. He is said to be mulling the merits of buying a vacation home.